For sandwich lovers everywhere, the ritual of turning leftovers into a very serious sandwich is a celebration in and of itself! My favorite part about holiday meals are the leftovers the next day and this sandwich definitely delivers. Preheat the oven to 350°F. Lay the strips of bacon in a single layer on a baking rack and place the rack on a baking sheet. Bake until crispy, then drain the bacon on paper towels. (Leave the oven on!). To assemble the sandwiches, lay 2 bread slices on a work surface. Place a slice of cheese on each slice of bread. Spread a tablespoon of mayonnaise onto the cheese, then top with 2 tablespoons of Cranberry Sauce. 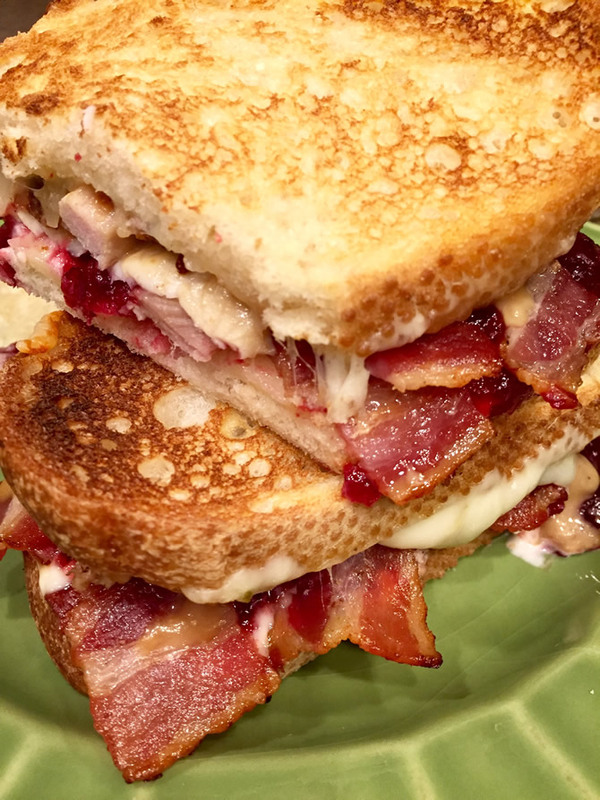 Pile 4 slices of crispy Hoffy bacon and the turkey on top and spoon some leftover gravy over the turkey. Transfer the open-faced sandwiches to a baking sheet. Place the remaining two slices of bread on the baking sheet and top the bread with the remaining slices of cheese. Bake until the turkey is warmed through and the cheese has melted, about 10 minutes. Assemble the sandwiches and enjoy!